Companies will usually release their reports throughout January, April, July, and October, but some will submit their reports even later. Experienced investors may have already noticed that the reports are usually released only after markets close, and often on Fridays. The main reason for this is that both the reports and the news surrounding them tend to affect company stocks, and therefore, they wish to mitigate stock volatility and minimise any potential losses as a result. So what can you do to be ready when earnings season comes? One great tool in your arsenal is access to the corporation's previous statements and earnings reports. If the company has been discussing an increase in sales throughout the year, or if their previous reports were all positive, it’s a good indicator of how their next earnings report is going to look like. Spend some time and do your research - it’ll be worth it. Pro tip #1: The full report will be available on the SEC’s EDGAR website. One of the most singularly useful tools out there is the Investing.com Alerts. Add the stock symbol or company name (only U.S. stocks at this time) to the list and you’ll receive an alert both on the website and in the app as it comes out. You can also get an alert 1 trading day before so you never miss an update again. After setting up the alerts, go to our Earnings Calendar and find exactly when the companies you’re interested in will release their earnings report. You can use the filter to find specific stocks, or filter the calendar by country, importance, or sector. You should probably add alerts for the companies you’re following so you’ll be notified as soon as the report is released. Market sentiment is not always the easiest thing to measure or even assess, but you can notice trends and follow discussions in investment circles to get a feel for what’s happening with your stock of choice. Use the investing.com forums to see what other investors think about each stock and join in the discussion. In addition, Investing.com lets you cast your sentiment and see how other investors on the sight feel about the instrument. The sentiment data is commonly used by financial institutions to make investment decisions. You also join discussions on websites such as Reddit, where many people congregate. It doesn’t matter if you’ve been investing for a while or just created your very first portfolio - there’s no need to reinvent the wheel. You don’t have to figure it all out yourself, because there’s more information out there than you realise, and sorting through it could take you more than one lifetime. Instead, start following people who already did all the legwork, and can give you quick answers (sometimes without having to ask). The best way is to start following pundits - start with your favourite Investing.com analysts and contributors by following them. Find someone you feel you can trust and whose tone you like, and read, read, read! 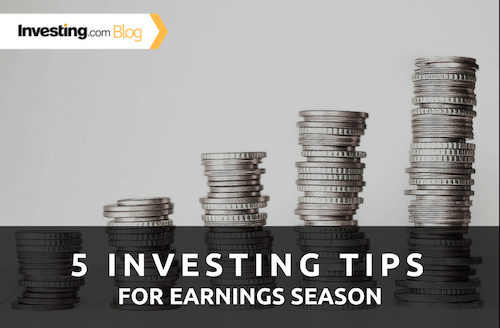 Investing.com produces plenty of analysis pieces, particularly closer to earnings season. Our experts will often release several pieces of analysis a day or 2 before a corporation releases its report, so make sure you read up, and never be caught unprepared. As you can see, there’s a lot of preparation to make before earnings season starts, and you’ll probably be reading a-lot. Don’t let it discourage you, and instead - realize that you’re getting ahead of the curve, and you’ll be armed with more knowledge than most investors. Trust in your gut feelings and remember to set your alerts. Thank you Jesse Cohen, for helping us with this list. You can follow him on Twitter: @Bob_Loblaw420.